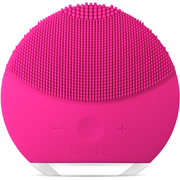 The FOREO LUNA™ mini provides a deep yet gentle cleansing action, effectively removing make-up, dirt and oil by using T-Sonic™ technology, which channels transdermal sonic pulsations across the skin’s surface. Suitable for use with any cleanser, your skin will be smoothed and refined in just three days! Featuring 1300 non-abrasive, hygienic, silicone-coated touch-points that are configured into three zones to suit all skin types, it cleans impurities from you pores to reduce blemishes. Waterproof and fully rechargeable, just one minute of use morning and evening will leave you with clearer, brighter skin. 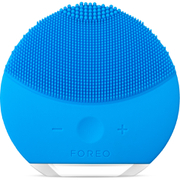 The LUNA™ mini is an innovative facial-cleansing device that directs T-Sonic™ pulsations through an ultra-hygienic silicone brush. 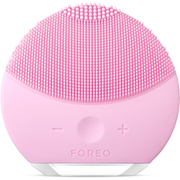 Compact and travel-friendly, it requires no replacement brushes and transforms the skin by removing breakout-causing impurities, leaving behind a healthier-looking, radiant complexion - as well as the confidence that comes with having clear and clean skin. Suitable for cleansing every skin type, the LUNA™ mini’s brush features thinner touch-points on one side to gently cleanse sensitive or dry skin, thicker touch-points grouped at the top for precision cleansing and broad touch-points on the reverse side for channeling pulsations more directly to cleanse and refresh oilier skin. T-Sonic™ technology refers to the up to 8,000 transdermal sonic pulsations per minute that are channeled through soft silicone touch-points to remove dead skin cells, and unclog pores of dirt, oil and make-up residue. T-Sonic™ technology delivers far more effective deep cleansing than just using the hands alone. This is because the fingers, in addition to often having oil, dirt, bacteria and other contaminants on them, cannot cleanse the pores as deeply as the LUNA™ mini or remove dead skin cells, as the LUNA™ mini has the ideal texture required to remove impurities from the skin. Unlike bristles, silicone is non-porous so it is resistant to bacteria build-up, doesn’t absorb dirt and oil, is easy to clean and quick-drying for an ultra-hygienic facial-cleansing device. Silicone is also not only body-safe and hypoallergenic, but far more gentle on the skin than similar products on the market thanks to its soft, smooth and non-abrasive texture. Remove all make-up, then dampen your face and apply your regular cleansing product. Turn on your LUNA™ mini by pressing the center button once. Cleanse each zone of the face (chin, cheeks, forehead and nose) for 15 seconds using gentle upward and outward strokes. After each 15-second interval the LUNA™ mini’s T-Sonic™ pulsations will pause momentarily, indicating it is time to move to a different area of the face. We suggest reducing the LUNA™ mini’s pulsation intensity with the center button before delicately cleansing the under-eye region using outward strokes. After 1 minute, the pulsations will pause 3 times in quick succession. Press the center button once more to turn the LUNA™ mini off, then rinse your face and apply your regular skincare products.